Reverse-engineering of KR580VM80A / i8080 is complete! We are glad to announce that reverse engineering of KR580VM80A (the most popular CPU in the exUSSR, Intel 8080-compatible) is finally complete. Insane engineer Vslav (1801ВМ1@gmail.com) recovered full schematic in a very short time. After we got annotation and sorted out license (CC-BY-3.0) - it is available for everyone to enjoy. It appeared that it had exactly 4758 transistors (contrary to rumors of 6000 or 4500). 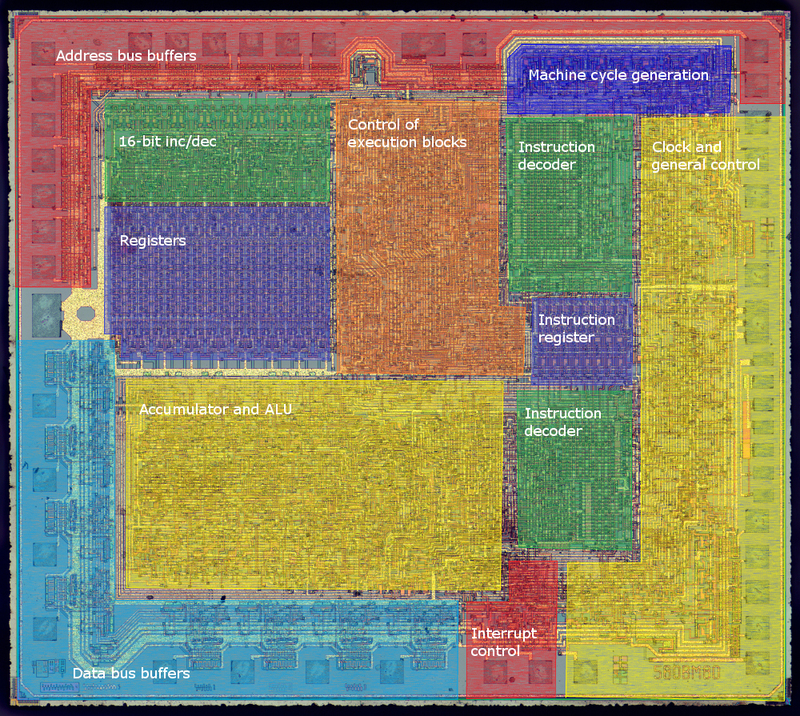 Layout of KR580VM80A is quite similar though not identical to i8080, but there were no differing (vs i8080) opcodes identified. Verilog model of KR580VM80A passed tough compatibility test both in simulation and as FPGA replacing actual KR580VM80A in "Specialist" computer. Download links: Main verilog, Schematic, Full package.